Jutta Tobkin, certified reboundologist and also known as the "Rebound Lady," says cells can be exercised through rebounding. 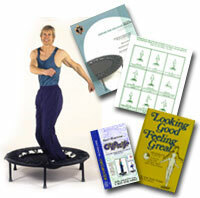 If you are not sure what rebounding is, Tobkin explains it as "therapeutic movement on the mini-trampoline" and goes on to say that "because it moves all parts of the body at once we can also call it a cellular exercise." A NASA report published in the Journal of Physiology (posted by the website Rebound UK) sites that benefits are "greater with jumping on a trampoline than with running." Cellular exercise strengthens the cells of the body for more efficient oxygenation, and rebounding is one of the best ways to do just that. The spring effect is the catalyst for giving rebounding its positive effect on cells and body. As we stand and go about our regular day to day activities we experience a G-force of 1. During rebounding our G-force increases. This is possible because during the jump you are momentarily weightless on the upward motion. Then, on the downward motion the amount of gravity it takes to bring you back to 1 causes pressure on your body to increase 2, 3, 4 or more times. The higher you then jump, the more G-force it takes to bring you back down to the ground or in this case to the trampoline. During this exhilarating activity we are taking in lots more oxygen. Therefore rebounding is a form of strength training that increases oxygen levels to the cells of the body with each jump. Moreover, the significant drop from weightlessness produces movement in the lymphatic system that then increases its action of taking toxins out of and bringing nutrients to our cells. In this process of detoxification and renewal, rebounding is stimulating and strengthening the immune system. Who can rebound? Anyone. The Journal of Physiology study was performed on young men of 19 through 26 years old but testimonials show that you do not have to be young, male or even an athlete to achieve great benefits. While it may seem that the emphasis should be put on a higher and higher jump, it has been shown that the greatest level of oxygen intake benefits occur with the 4 G-force level. Even standing on your trampoline and bouncing with both feet level on the surface produces results from the calming and meditative repetitive movements of the spring. Overall, rebounding is a resistance activity that promotes strength, flexibility, endurance, and aerobics with all of the benefits of the more traditional forms of exercise such as weight lifting and running -- only it's more easily achieved and accessible to more people. You can even sit on your trampoline and bounce and obtain benefits. Other benefits of rebounding are: creating a balance in the overall body, improving blood flow, and strengthening mind-body unity through its meditative effect. Keep in mind that in selecting a trampoline to rebound on you want one that gives a soft bounce and has an 88% to 90% shock reducing effect to protect your knees and other joints as you progress. Try rebounding for just 3 minutes or less at the beginning, increasing gradually as your body becomes used to it. Jump higher and longer as you become more expert at it, Tobkin advises. She worked out a 30 minute routine for herself and suggests that you bounce as long as it feels good to you.